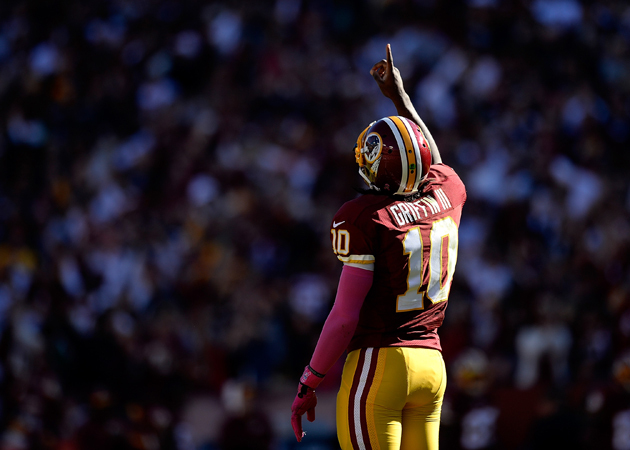 Quarterback Robert Griffin III’s tenure with the Redskins began with such promise, and quickly took a sharp turn in the other direction. 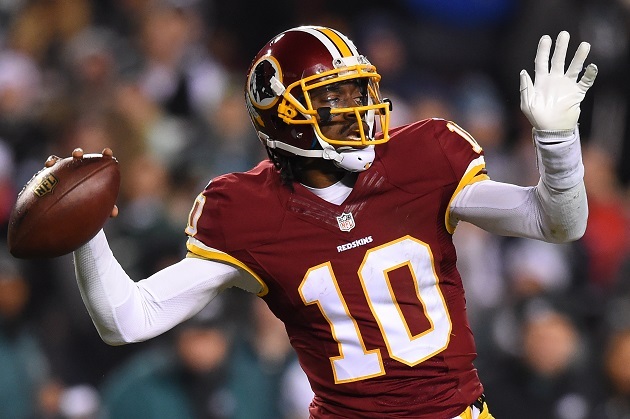 Quarterback Robert Griffin III’s tenure with the Washington Redskins began with incredible promise, but it quickly took a sharp turn in the other direction. 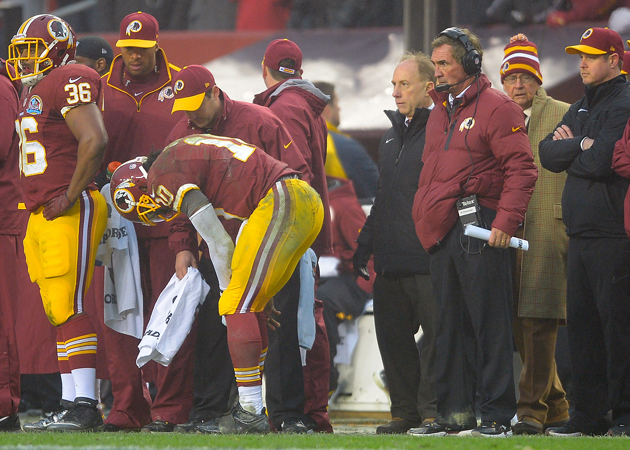 After leading Washington to the playoffs in 2012, injuries and dysfunction combined to derail Griffin’s early success. He regressed in 2013, missed most of 2014 and was active for just one game in 2015. Washington finally released Griffin in March, and with the quarterback set to join the Browns, here is a timeline of his career so far. already on the team, St. Louis deals its pick to Washington ahead of the draft. In exchange, St. Louis receives Washington’s first-rounder (No. 6) and second-rounder (No. 39), along with its first-round choices in 2013 (No. 22) and 2014 (No. 2). 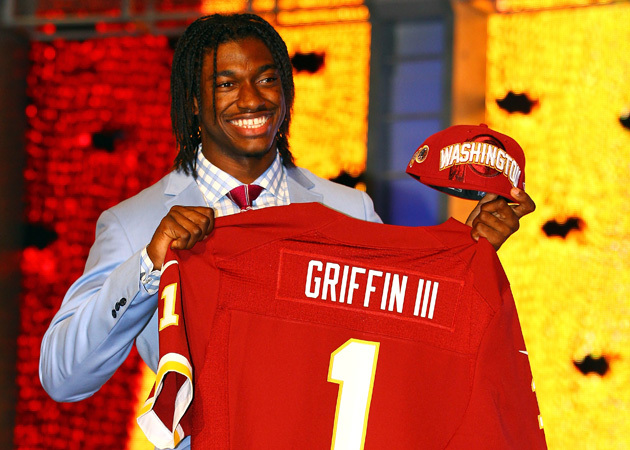 The Redskins choose Griffin, a dual-threat quarterback out of Baylor who won the Heisman Trophy in 2011 after throwing for 4,293 yards and 37 touchdowns with 699 yards and 10 touchdowns rushing. The Rams end up trading the No. 6 pick to Dallas for the Cowboys’ first and second round selections, and eventually find themselves with an eight-player haul as a result of the trade. 40–32 in New Orleans. 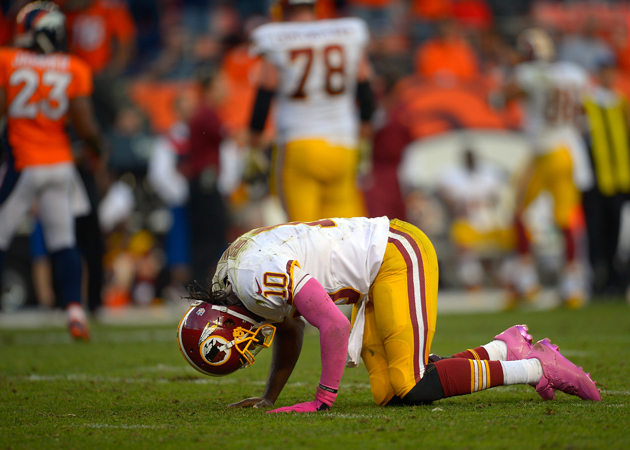 Fans start ‘RG3ing,’ mimicking the pose he made while falling to the ground after his first career touchdown pass.
. He is diagnosed with a mild concussion, and returns in Week 5. Perhaps the defining play of Griffin’s rookie season comes in Week 6 against the Vikings. Griffin helps Washington rally from an early nine-point deficit and puts the team in front 31–12 in the fourth quarter. After Minnesota rallies, cutting the score to 31–26 late, Griffin scampers for a 76-yard touchdown to seal the win. 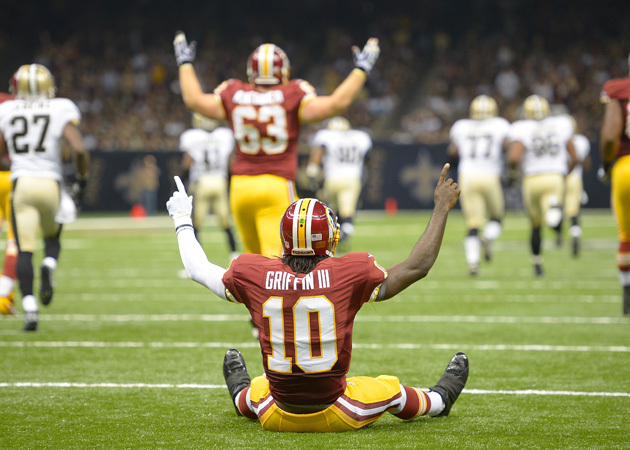 Amid a seven-game winning streak that would help lead the Redskins to an NFC East division title, Griffin throws four touchdowns in a win over the Eagles on Nov. 18. He matches that performance just four days later on Thanksgiving in a win over the Cowboys. In those two games combined, Griffin throws eight touchdowns and just one interception, also recording 113 yards rushing. that Dr. James Andrews, the team’s orthopedic consultant, examined Griffin and allowed him to return. that he never examined him. 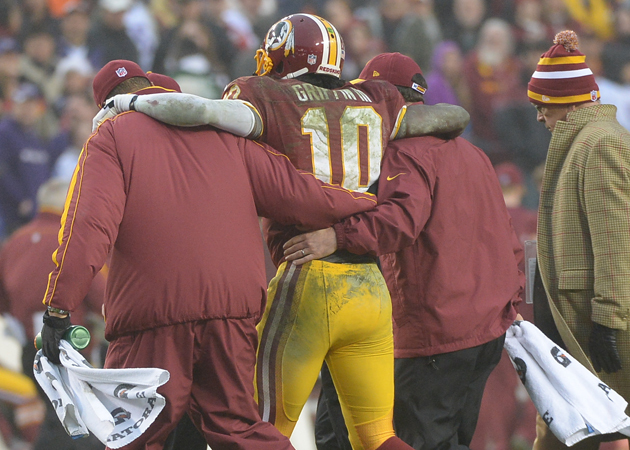 In a wild-card loss to the Seattle Seahawks, Griffin twists his right knee, re-injuring it. Three days later, he has surgery to repair his ACL and LCL. , 33–27. 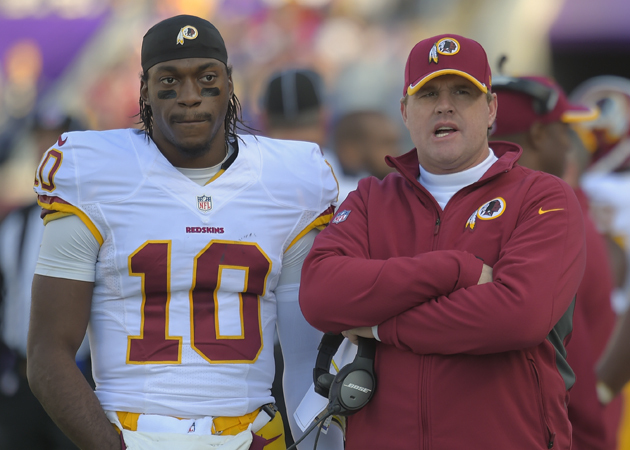 Washington starts the season 0–3. Oct. 20, 2013 – Out of his slump? 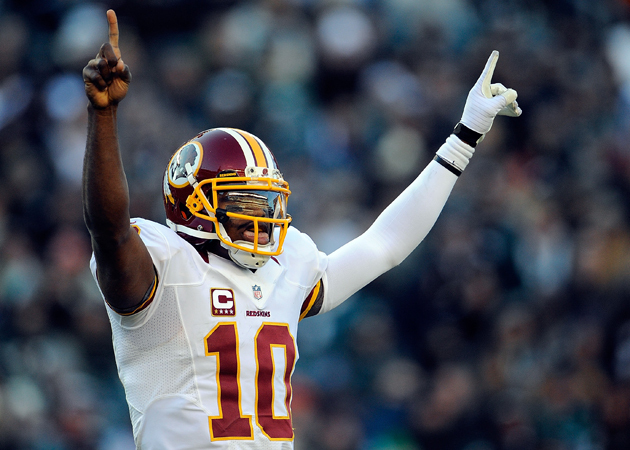 leads the Redskins to a 45–41 win over the Bears behind 298 yards passing and two touchdowns, with 84 yards rushing. He completes 15 of 30 passes for 132 yards, one touchdown and two interceptions before being replaced by Kirk Cousins. 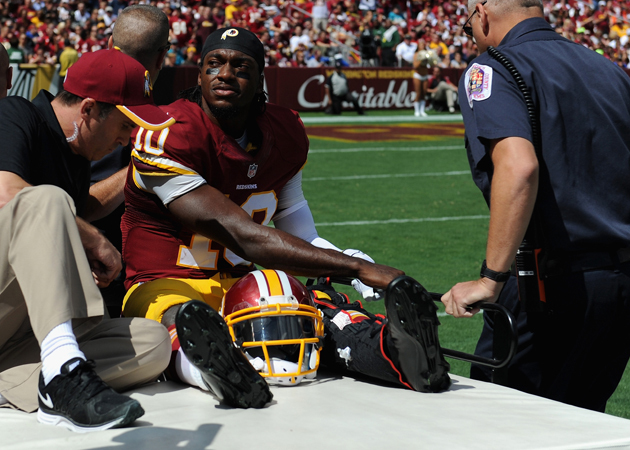 Despite the injury, Griffin is able to return for the Redskins’ next game. For the first time in his collegiate and professional career, Griffin fails to record an offensive touchdown. announces that backup Kirk Cousins will start in place of Griffin for the remainder of the season to eliminate the risk of further injury. 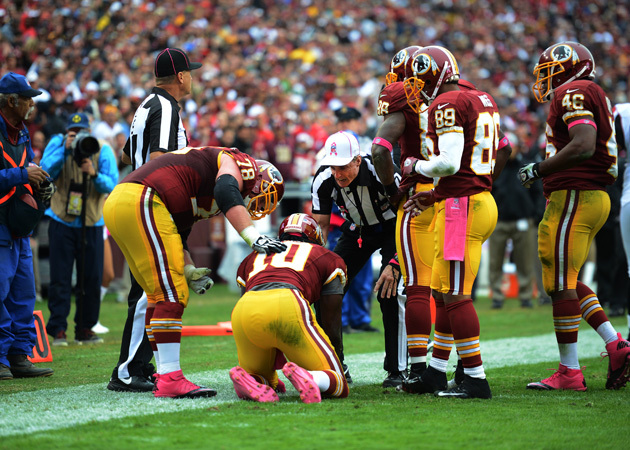 In Week 2, Griffin leaves with an ankle injury after just three plays. 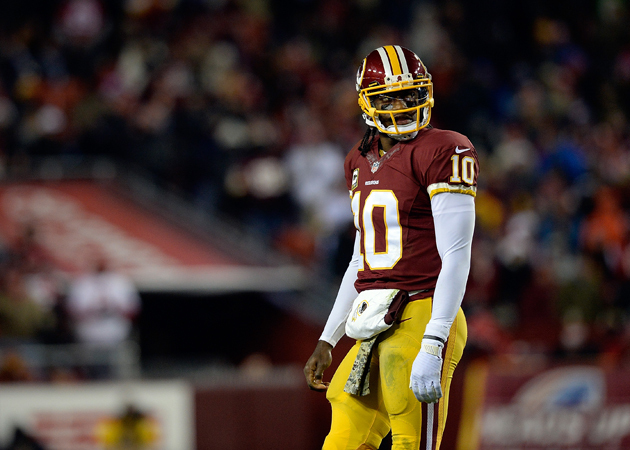 He is replaced by Cousins, who throws for 250 yards and two touchdowns in a blowout win over the Jaguars. The injury would keep Griffin out seven weeks. benches Griffin in favor of Colt McCoy. Griffin re-gains the starting job after McCoy injures his neck and reels off three encouraging performances. 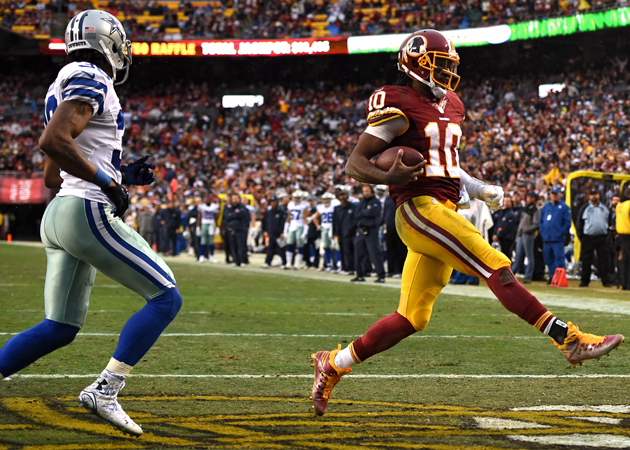 In the Redskins’ season-ending loss to the Cowboys, Griffin throws for 336 yards and a touchdown, with two interceptions. He also scores his first rushing touchdown since Dec. 30, 2012.
says that Griffin requested that he change the offense after his rookie season. 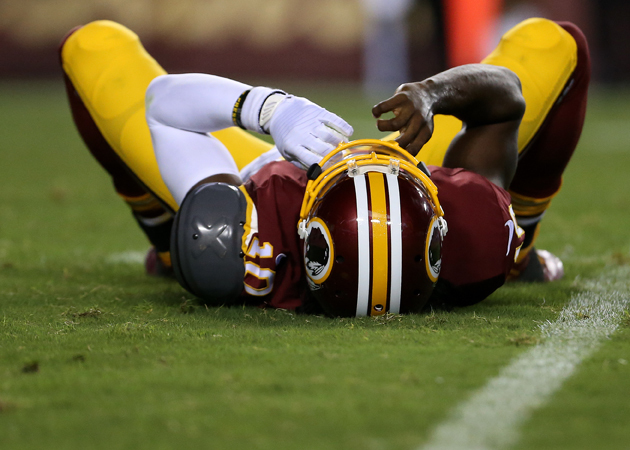 Griffin is hit in a preseason win over the Lions and sustains a concussion. 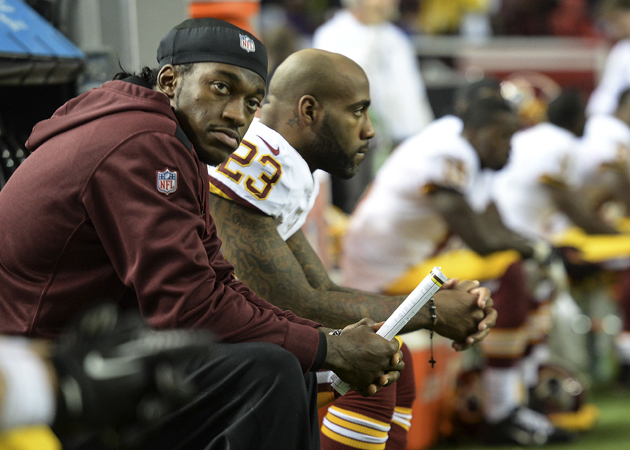 He isn’t cleared to play until September, and falls to third on the depth chart behind Cousins and McCoy. 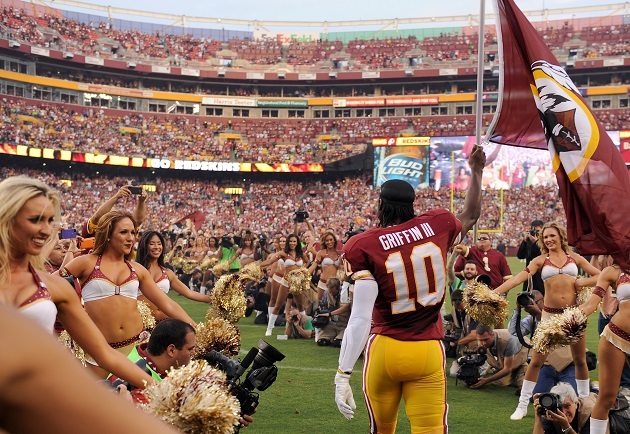 After he was inactive for all but one game during the season, Griffin clears out his locker at FedExField, leaving behind only a quote from Mother Teresa that had hung there all season. 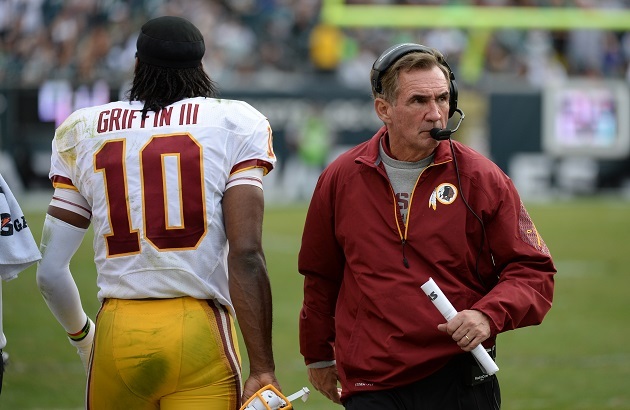 Griffin is informed by the Redskins that he has been released, ending his tenure in Washington. The second act of Griffin’s career begins, as he agrees to join the quarterback-needy Cleveland Browns.